Prisoners transferred from Leith Tolbooth to Edinburgh Tolbooth. ( The Book of the Old Edinburgh Club, Vol 12 p 184). 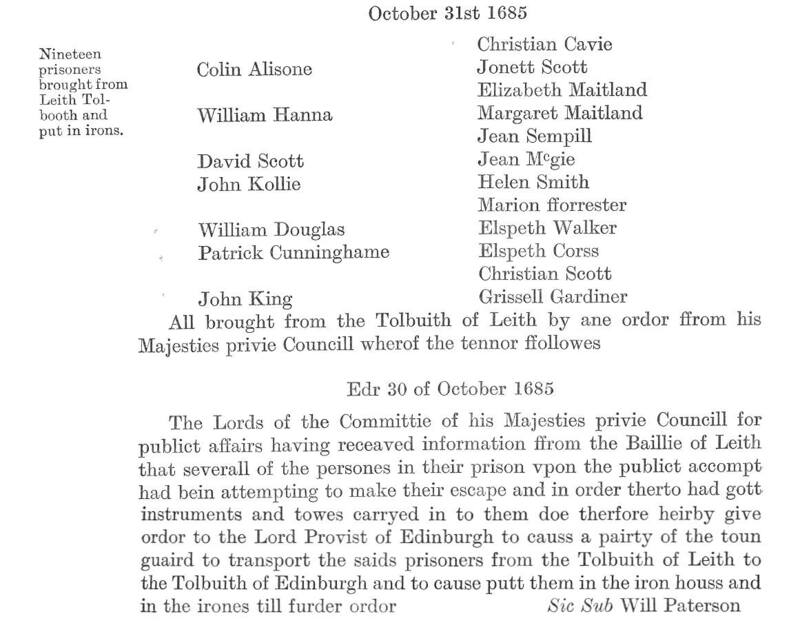 These 19 prisoners were transferred from Leith Tolbooth to Edinburgh Tolbooth in October 1685 and ordered to be held in irons because, it seems , some or all of them, tried to escape. Included among them are several persons who were among those listed in Dunnottar Castle. NOTE: the Edinburgh Tolbooth records are dated 31 October 1685, which is after the “Henry & Francis” had sailed, thus similar / same named persons in that list of passengers must be in doubt.